OK, Lake Temescal isn't really a neighborhood although there are houses not far away that overlook the lake from the Broadway Terrace area. But it's quite pretty, and the marathon goes right past the lake. The bike path that marathoners run on is the former right-of-way of the Sacramento Northern Railway, which ran from Chico via Sacramento to Oakland, and on to San Francisco via the Bay Bridge. For a brief period (approximately 1939-40) one could board a train in downtown Chico and ride all of the way to the Transbay Terminal in San Francisco without changing trains. Sure is a good thing we don't have that now, since our transportation system is so much more advanced compared to 70 years ago. Or is it? From Rockridge to Lake Temescal runners do some serious uphill work, but there's plenty more in store for them on the way to Montclair. 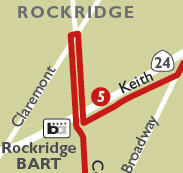 The Oakland Marathon goes north on College Avenue through the heart of the Rockridge district. In my arbitrary way, I designated the area of College Avenue north of the Rockridge BART station as "Rockrdge north", though as I remarked in the previous post, I've never heard anyone refer to a "Rockridge north" or a "Rockridge south". The race itself does a U-turn at the intersection of College and Claremont Avenue (and two other smaller streets that make for a long traffic cycle) passing back under the BART station only to make an immediate left (east) turn that takes runners up, up, up into the Oakland hills. The U-turn at the College & Claremont intersection is as close as the race comes to leaving Oakland's city limits, because the next crossstreet on College is Alcatraz Avenue where Berkeley begins. Since 1990 I have spent a great many hours in Rockridge, in particular from the area just south of BART to the vicinity of the College/Claremont intersection. It's one of Oakland's areas I know best, and one I always cite when I hear folks ragging on Oakland. Two of my favorite dining places anywhere, are almost across the street from each other on College north of BART: Zachary's Chicago Pizza (the best deep-dish pizza) and Barclay's Restaurant & Pub (outstanding pub food and 30 craft beers on tap at any given time). Oakland's oldest runnng store, Transports. is a block up from Barclay's, while a women's-oriented running store ("See Jane Run") is almost next door to Zachary's. There are two Japanese restaurants, a Burmese restaurant, a couple of coffeehouses, a fine taqueria, a Great Harvest bakery, and plenty more I can't remember. And there's the fun Claremont Diner (inexpensive high-quality American comfort food) with the coolest booths, and an electric train set overhead, which is right next door to The Graduate, a pleasant dive bar, situated at the complicated intersection of Claremont and College. Oh, and a Trader Joe's in what was formerly a Lucky supermarket. A Julia Morgan designed church is next door to the headquarters of Dreyer's Ice Cream. (Julia Morgan is one of the most famous Bay Area architects, renowned among other things for her work on Hearst Castle.) Dreyer's began in Oakland as a family owned ice cream company and is now the largest ice cream maker in the country. It remains headquartered right on College Avenue in a three story building with an ice cream shop that belies the fact that the corporate offices are hidden in plain sight. You can see all of this in the few blocks of College Avenue in Oakland stretching north from the Rockridge BART station to the Berkeley city limits. And the residental side streets are among the most pleasant you'll find. That ice cream parlor is Dreyer's headquarters? No, but it's in the 3 story building that houses the ice cream parlor. On Chabot Road a crossstreet to College, is located the Dominican teaching facility, St. Albert Priori, which is affiliated with Berkeley's Graduate Theological Union. The grounds are lovely. This stately and immaculate Victorian sits across the street from St. Albert Priori. It is a rare Victorian that lies in a neighborhood largely given over to Craftsman-era bungalows, and some more recent structures. When I moved back to California from Seattle in 1990, the Rockridge area quickly became my "hood". Not that I really lived there then or since, but I used BART to get to San Francisco where I worked, and the nearest BART station to where I lived was Rockridge. Oaklanders are well aware of Rockridge even if the rest of the world isn't. It is Oakland's version of Noe Valley in San Francisco, but with better weather. While I don't think there's a precise definition for what Rockridge encompasses, everyone thinks of College Avenue as being its "Main Street", and includes the residential areas that lie both to the west and east of College. These neighborhoods are close to heaven, if you are someone like me, who thinks the Craftsman style of architecture is about as good as it gets. (Oakland, and not just Rockridge, have amazing examples of the Craftsman style.) Every now and then, however a lone Victorian can be found among the early 20th century homes, representatives of an even earlier era when there weren't many houses in the area. College Avenue, like the previously mentioned Telegraph Avenue, breaks off from Broadway and ends on Bancroft Avenue on the south side of the Cal campus in Berkeley. Unlike Telegraph Avenue, there isn't a business district on College Avenue close to the campus, although north of Rockridge the Elmwood area on College at Ashby is a lovely neighborhood and business district in Berkeley. On Broadway, across the street from where College Avenue starts, is the California College of the Arts, formerly known as the California College of Arts & Crafts. Several businesses oriented toward art students are here, along with restaurants, coffeehouses, and other enterprises. You don't need Whole Foods if you live in Rockridge. The Market Hall complex at Shafter and College (immediately across from the BART station) offers a remarkable array of individually owned shops that offer produce, pasta, baked goods, meat, fish, cheese, wine, coffee, and more. Great people watching from a sidewalk table at Peaberry's Coffee. And one of Oakland's best loved restaurants calls Market Hall home: Oliveto. Bring your wallet but be prepared for a great meal. The food and service are outstanding. I've eaten here twice - terrific. As with Chez Panisse in Berkeley, the downstairs cafe is less expensive. Chico readers take note that the Craig Thomas+Maria Venturino husband-and-wife team that own the splendid Red Tavern, previously cut their teeth at the renowned Citron restaurant in Rockridge (south), which they sold when they moved to Chico. Besides Oliveto and several other top restaurants that include À Côté and Pizza Rustica, College Avenue south of BART has lots of less pricey restaurants of many persuasions, and bookstores, dive bars, antiques, a thriftshop, and so on. One of my favorites is Ben & Nicks, kind of a dive bar with windows, deep and dark booths, and pretty darn good food. If you don't want to walk, take the AC Transit 51 line which runs the length of College and much, much more (to Alameda and Berkeley). I close this post with a most unattractive picture: the Hwy. 24 bridge over College Avenue in the middle of which is the Rockridge BART station. On the other side is Rockridge (north). The now grown-up trees have helped to soften the late 60s gash on the neighborhood. This is just a quick get-out-the-news post. Last fall I wrote about Trains & Travel's excursion train up the Feather River Canyon to Portola in August. Well, today I received an e-mail blast from them announcing another 3-day excursion over the 3-5 June period. This excursion consists of 3 days of daytime travel from Emeryville to Oroville, then Oroville to Klamath Falls, and then Klamath Falls back to Emeryville. This trip includes the Feather River canyon (as far as Keddie), followed by an exceptionally rare trip up what is called the "Inside Gateway" from Keddie up through Lassen, Modoc, and Siskiyou Counties to Klamath Falls, then from there back to Emeryville. Chico area readers take special note: there is a 2-day option that allows boarding in Oroville on 4 June and detraining in Chico on 5 June. Rather than recapitulate everything, here's a link to their website with the details. This will be an awesome trip! Further good news from Trains & Travel is that they expect to operate their Cuban rail tour late this year, because the Obama adminstration has sensiby relaxed some of the regulations on educational travel to Cuba. The heart of the Temescal neighboorhood business district runs along Telegraph Avenue from roughly 41st Avenue to 51st. Telegraph Avenue, by the way, begins in downtown Oakland at Broadway and runs through Oakland and Berkeley to end at Bancroft Avenue on the south side of the University of California ("Cal") campus. The last stretch of Telegraph south of the campus is what became notorious in the 1960s and 70s. ﻿﻿Temescal is an area that has changed a lot in the twelve years since I left the East Bay, and pretty much all for the better. But some may mourn the long gone Pussycat Theater, which once "graced" the northeast corner of Telegraph and 51st. Since being torn down in the 90s, its site has remained a vacant lot. Yes, the Pussycat Theater was a place that showed raunchy movies. At the south end it remains a heavily Korean business district. Maybe it's called Koreatown - I've never heard that - but establishments with Korean names predominate. I've been to the Tofu House (pictured here). You might expect it to be vegetarian with this name - it isn't. Like so many areas of Oakland, diversity in eating is the name of the game here. On a walk up and down Telegraph, in addition to Korean, I saw Spanish, Burmese, pizza, pizza/brewpub, Chinese, Mexican, Ethiopian/Eritrean, Moroccan, and more. The route of the marathon runs north on Telegraph, then makes a right (east) turn on 51st. Don't get too tempted by all of the dining choices as you're only 3 miles into the race at this point. Piedmont Avenue starts as a diagonal street that breaks off from Broadway and concludes at the entrance to a large cemetery, a short distance beyond the intersection with Pleasant Valley Avenue. The vibrant, walkable business area is between Macarthur Boulevard and 51st Avenue and includes many shops, restaurants, bars, and a theatre. Fenton's Creamery, a longtime East Bay favorite, calls this neighborhood home, as does one of Oakland's long time high-end restaurants, Bay Wolf. Cato's Ale House, is a favorite place of mine for a great selection of draft beers, pizza and salads. For a list of Piedmont Avenue businesses see this article from the Chronicle and this map from the Oakland CVB. The heart of the Piedmont Avenue neighborhood is the intersection of Piedmont Avenue with 41st Avenue. The marathon course takes a left turn on 41st. Surprisingly perhaps, Piedmont Avenue is entirely within the city limits of Oakland. The separate (and very, very wealthy) city of Piedmont is close to Piedmont Avenue but not a part of it. The city of Piedmont shares the 94611 zipcode with parts of Oakland but is otherwise its own entity. In my last post you read about Amtrak’s long-distance services from the west coast to Chicago and New Orleans. Here you’ll see Amtrak’s three long-distance overnight trains from Chicago to the east coast. One other train that operates west-to-east in a diagonal route from New Orleans to New York, the Crescent, was covered earlier in the north-to-south long-distance trains. The Cardinal operates on a rather circuitous route between Chicago and New York. Major cities it calls on include Indianapolis, Cincinnati, Charleston, W.V., Washington D.C., Baltimore, and Philadelphia. It’s not a large city, but it also stops in White Sulphur Springs, W.V., location of the celebrated Greenbrier resort. The Cardinal, like the Sunset Limited, is a long-distance train that unfortunately only operates three times per week each direction. Scenery along the way can be quite pretty as the train traverses the Shenandoah Valley in Virginia, and through the Blue Ridge and Allegheny Mountains. The Capitol Limited’s run to Washington, D.C. is more direct and thus faster, than that of the Cardinal, and it is a daily train. The large cities it stops at include Toledo, Cleveland, and Pittsburgh. The best scenery is nearest to Washington, D.C. in the Potomac Valley. The Lake Shore Limited is another train that splits (or combines) to serve two destinations. Eastbound the train begins in Chicago traveling overnight to Albany, N.Y., where it splits into two sections: train 48 heads south along the Hudson River to New York, but train 448 continues east to Boston. Operating westbound, train 49 originates in New York, while train 449 begins in Boston. In Albany, the two sections are combined into one train that runs overnight to Chicago. Besides the train’s three endpoints, the other principal cities served include Toledo, Cleveland, Buffalo, Rochester, and Syracuse. The best scenery is along the Hudson River in New York and in the Berkshires in western Massachusetts. The next post in the Amtrak Service and Fares series will cover short-distance (not overnight) corridors in the east and Midwest.